Digipak. Booklet inside. Cover based on the original 1970s bootleg vinyl, which included four soundboard recordings from San Diego 1974. Sonic Zoom traced the original soundboard tape and remastered from that, to include extra between song chat and music. Jewel case. Booklet inside. New cover. 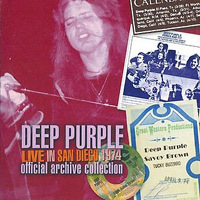 Retitled Live In San Diego 1974.